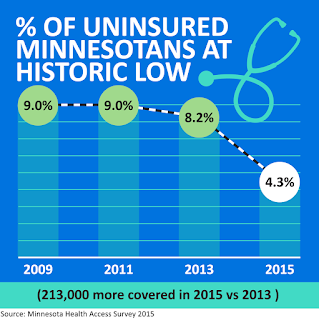 A new report from the Minnesota Department of Health (MDH) and the University of Minnesota finds that Minnesota cut its uninsured rate nearly in half between 2013 and 2015, and the rate of Minnesotans without health insurance has now reached an all-time low. The report cites recent health reform efforts and an improved economy as key factors that drove down the state’s uninsured rate, as more than 200,000 Minnesotans – including 35,000 children – gained health insurance coverage between 2013 and 2015. 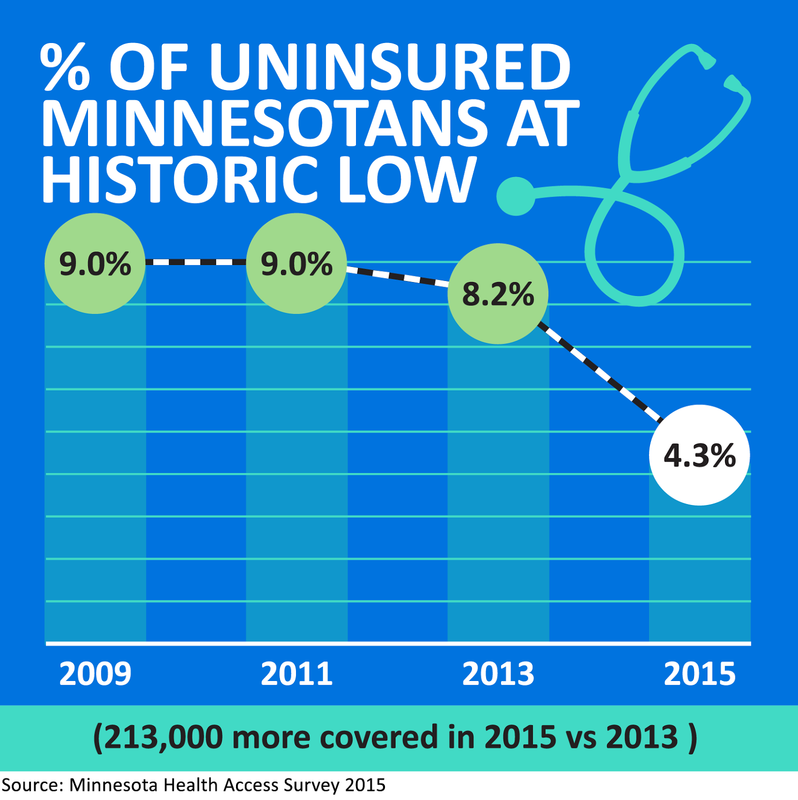 The percent of Minnesotans without health insurance fell to 4.3 percent in 2015 – the lowest rate in state history – according to the survey conducted by MDH and the University of Minnesota’s State Health Access Data Assistance Center. During the same time, a decade-long decline in the rate of Minnesotans who receive health insurance through an employer was halted. The percent of Minnesotans who have employer coverage remained steady, while the percent of Minnesotans purchasing health insurance on their own rose slightly. About 10 percent of Minnesotans reported getting their coverage through MNsure. “Today’s news confirms that more Minnesotans are getting health insurance coverage. This is great news for Minnesota,” said MNsure CEO Allison O’Toole. “However, our work is not done yet. All groups of Minnesotans, regardless of income, racial or ethnic group or age, reported increases in health insurance coverage. For example, uninsured rates for Hispanic/Latino Minnesotans fell by nearly 200 percent from 34.8 percent in 2013 to 11.7 percent in 2015. However, Commissioner Ehlinger notes the disparity in insurance coverage persists between white Minnesotans and American Indians and Minnesotans of color. Health insurance is designed to provide access to health services and protection from high medical bills. In 2015, more than three-quarters of Minnesotans with health insurance reported their insurance protected them from high medical bills, and 93 percent of Minnesotans felt confident they could get the health care they need. Nonetheless, two in 10 Minnesotans still reported not getting needed care because of cost in the past year, a rate unchanged from 2013. “Monitoring the extent to which health insurance access translates into access to health care will be important as more Minnesotans gain coverage,” said Kathleen Call, a lead researcher on the study and professor at the University of Minnesota School of Public Health. The MDH report is available online from the Health Economics Program.